The first time I encountered the comparative method of looking at cards was via Valerie Sim’s deck, the Comparative Tarot. The cards in this cleverly designed deck have not one image, but four different images of the same card. It was one of the first decks that I bought and I still regard it fondly. Not familiar with the Comparative Method? Here’s the skinny: You don’t just interpret ONE card, you interpret the others on the card too – each one adding depth and colour to the over all ‘character’. So I thought we’d try it here with The Prince of Cups – just comparing three images – but you can do it with as many cards as takes your fancy. Or you can fit onto your table top. Or bedroom floor. 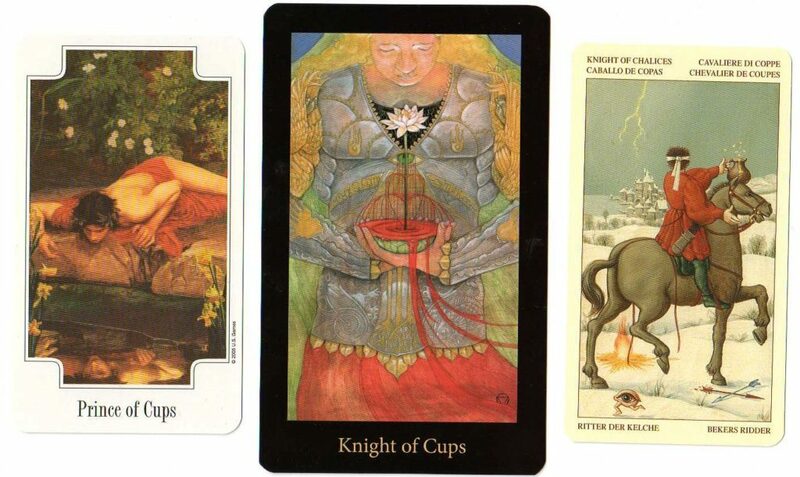 I chose the Prince/Knight of Cups from the outrageously stunning Mary El deck by Marie White; the Prince of Cups from the Transformational Tarot by Arnell Ando and the Knight of Chalices from the Breugal Tarot by Guido Zibordi Marchesi. click on image to enlarge. I think. Arnell’s Prince (left hand card above) perfectly captures that romantic, self-absorbed feeling that comes with the Prince of Cups. It shows the youth Narcissus gazing ito his own reflection by the pool. Poor old Narcissus was so wrapped up in himself that he drowned trying to embrace his own reflection. I’ve had boyfriends like that. The Knight of the Mary El (central image) is also introspective, protectively clasping a grail that overflows with blood and from whose depths a lotus flower rises and blossoms. This is the Grail Knight. Marie White, creator of the Mary-El says: ‘Searching for matters of the heart; love, meaning in life. Compassion, experience and maturity is the key.’ If you don’t know the story of Percival, the Grail Knight here’s a 10 second summary: In his naivity, Percival, a knight who is searching for the Holy Grail fails to recognise it the first time he encounters it and so he is compelled to set off on his quest again – older, wiser – and finds it. And heals the Fisher King. The end. Our final Knight is the Breugal Knight (right hand image). His horse steps confidently to the right of the card, but he is not looking in the same direction as his horse. In fact, he looks as though he has a blindfold on. Even with the blindfold, he is looking towards a distant village that lies beneath a fork of lightning. He doesn’t hold a grail, but a tankard filled with flowers. Neither hand holds the horse’s reins. Either side of the horse we see a camp fire, crossed arrows and – bizzarely – an eye running to the left on a pair of little legs! I think that the Breugal LWB perfectly encapsulates what’s going on here: ‘Where there is love, the eye follows’. Using this Comparative Tarot method then, I would say that this Knight DOES have focus – but he doesn’t always focus it on what he SHOULD be focussed on, as far as the outside world is concerned. As a result, he can seem dreamy and self-absorbed to other people and can display a level of cold-heartedness to that which is outwith his field of vision. What do YOU think of the Knight of Cups or the Comparative method? Four VERY mini decks lol! So, you were a deck snipper before it became trendy then, Ruth, well done! This is one of my favorite things to do. I haven't done one in a while but I used to do it on my blog. I love the connections you point out! Well done. As usual. I don't do it nearly enough – take it out from your Tarot wardrobe and give it a dust down and an outing! Hi Ali, What a great idea, I will certainly give this one a go!! Right, I really get where you are going with this,but I see the symbols of eyes and lightening as third eye, intuitive connections,looking deeper than the surface (could this apply to the prince of cups in the first card perhaps?) Loving Arnell's prince!! Absolutely – I'm totally fine with that. I love your idea of Arnell Ando's Prince looking 'deeper than the surface'.